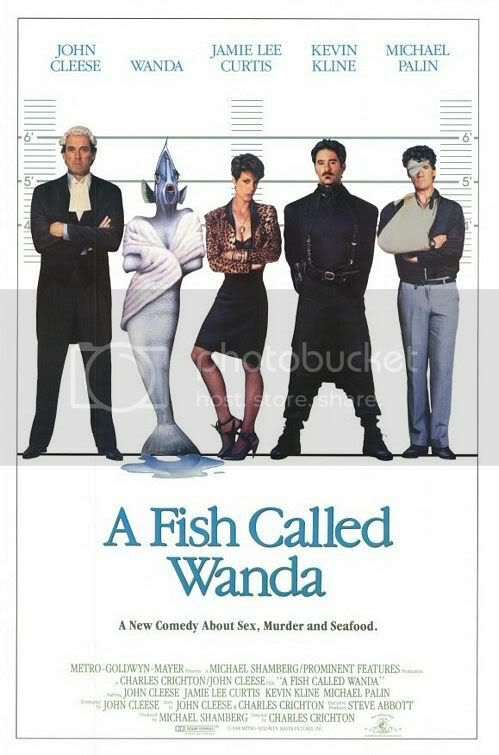 A Fish Called Wanda has one of the most intelligent scripts of any comedy. Perhaps this is why I do not generally like comedies; the good ones are so few and far between. The story is a collaboration by Charles Crichton, who also directed, and John Cleese. Cleese, the former Monty Python member, misses no opportunity to scathingly satirize proper English living, but he does so gently and warmly, even playing the epitome of British wussiness himself. 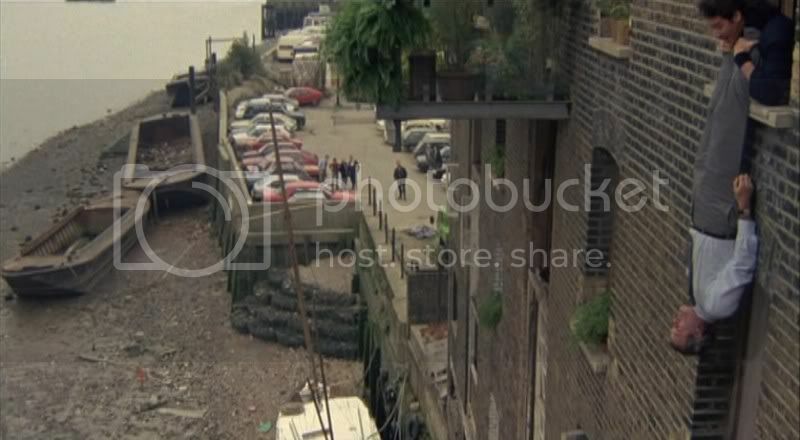 Cleese plays Archie Leach, a prim and proper barrister. He is assigned the case of Georges Thomason (Tom Georgeson), an intelligent thief. Georges has recruited a crack team of burglars to steal a large amount of diamonds, but is turned in by his girlfriend/accomplice, Wanda (Jamie Lee Curtis). Wanda is an American, young and buxom. She knows how to use her assets, both physical and intellectual, to get what she wants. What she wants is the entire stash of diamonds to herself. To that end she enlists Otto (Kevin Kline in an Oscar-winning role). Pretending to be her brother, they are actually secret lovers with some odd quirks. She is irrationally turned on by Italian, while he gains stamina and strength from sniffing his own armpits. Otto is also rather dim-witted, though as a supposed ex-CIA agent also quite handy with weapons. The cast of criminals is rounded out by Ken (another ex-Pythoner, Michael Palin), a stuttering, stammering handyman with a fondness for animals. Wanda turns Georges into the bobbies, but realizes her plan has been thwarted when it is apparent that he has hidden the diamonds. Attempting to uncover their location she sidles up to Archie Leach, using her American forwardness and cleavage to enter his life and find information. Her efforts at seducing him are constantly thwarted by Otto, who is stupidly jealous and unaware of her ultimate intentions. Meanwhile, Ken is assigned the task of offing an old woman who witnessed the foursome fleeing the scene. He is left aggrieved and horrified when he accidentally starts killing her three small dogs. Ken’s solo scenes are some of the most humorous in the film. 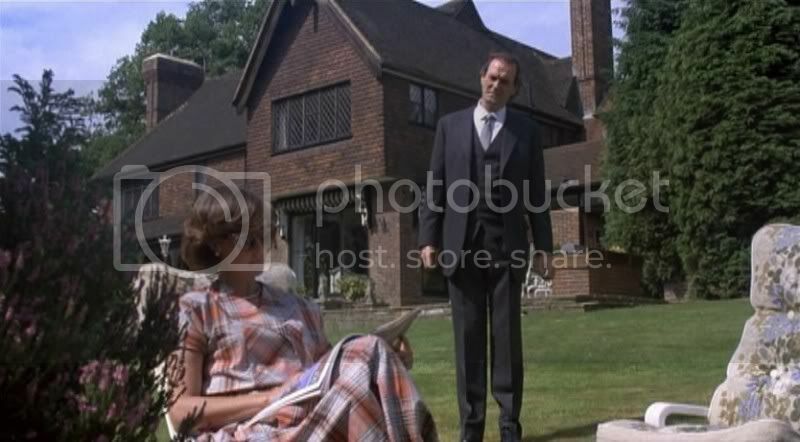 The best moments, though, involve Archie and his respectable wife, Wendy (Maria Aitken). Their marriage is staid and proper, with no passion or heartbeat. Archie mentions that the English are “terrified of embarrassment. That’s why we’re dead.” When given the opportunity to start an affair with the young, vivacious Wanda his heart starts beating again, even though there must be some ulterior motive behind her approaches. When forced to cover up their attempted affair, Archie stutters and stammers as badly as Ken, while pro-liars Wanda and Otto are adept at convincingly sidestepping the truth. The plot is complex, the characters vivid and quirky, and the script brilliant. Rarely has a film had so many characters that provide such a variety of laughs. Ken is sensitive, but used worse than any other character. Georges is the only one that appears to genuinely trust him, whereas Wanda and Otto merely want to extract the information with which Georges has entrusted him. Otto is the stupidest character, but also one of the most amusing. His faked come-ons to Ken are sudden and unexpected, all the more hilarious because of Ken’s shocked reaction. I’m not sure anyone in the film ends up doing the right thing. They are all criminals in some way or another, and even Archie falls into their way of life. His meager attempts to end the affair with Wanda are short-lived and unconvincing, though he perhaps knows that he’s trying to do the right thing. Even his actions at the end of the film, and his ultimate fate, are not particularly admirable. But he remains a spineless example of prim British-ness, steamrolled by aggressive Americans who know what they want and how to attain it. Along the way he is subjected to doses of humiliation that would strike dead a normal Englishman. By playing the role himself, Cleese shows that he is in on the joke as an example of the stereotype that he is lambasting. Cleese’s and Crichton’s writing, combined with excellent acting by an experienced cast and adequate directing, provide one of the most wholly humorous and satirical comedies in the past couple decades. This entry was posted in 3.5 pirate flags, 3.5 stars, F, Movie Reviews, Pirate Flag Rating, Star Rating on April 5, 2010 by Tim Irwin.